Many of the great managers would certainly have been able to empathise with the Argentine World Cup winner. Infamously, he would go to most lengths to do so. Indeed, Bilardo’s reductive approach came to represent one side of the great Argentine football debate of the ’70s and ’80s. His pragmatism against Cesar Menotti’s purism. End result against entertainment. Bilardo’s teams were often unattractive and ugly to watch. The two red cards his Argentina team received in the 1990 World Cup final were only reflective of his own football upbringing at the notoriously aggressive Estudiantes of the ’60s. But, despite his dogma, Bilardo didn’t actually win that often. In truth, the only genuinely successful period of his career lasted no more than a decade. First, when he returned Estudiantes to the peak of Argentine domestic football over 1982-83, then when he took over the national team and Diego Maradona. As Jonathon Wilson wrote in Inverting the Pyramid, “presenting one of the most system-driven managers of all time with arguably the greatest individual player of all time could have been one of football’s great ironies; as it turned out, it simply inspired Bilardo to the last great formational change” – wing-backs. The formation allowed Maradona to roam free and thereby single-footedly rule a tournament. Bilardo’s inspired move was just enough to win the 1986 World Cup final and get to the final four years later. And, despite failures at Colombia and even his own Estudiantes, it also proved just enough to get him on this list. A manager that broke ground in a very understated way. With 17 minutes of the 1986 European Cup final left and the score at 0-0, Barcelona were finally beginning to force the matter. By contrast, Steaua Bucharest were starting to look fragile for the first time. It was at exactly that moment, however, that Jenei – one of football’s great thinkers – had an epiphany. Although his nominal assistant manager Anghel Iordanescu had not played a minute all season, Jenei realised that the midfielder’s poised passing style would have a calming effect on Steaua. It did. And the team and keeper Helmuth Duckadam famously kept their cool in the shoot-out as Barcelona collapsed. As such, a substitution that has since gone down as a masterstroke delivered eastern Europe’s first ever European Cup. In truth, of course, very different kinds of strokes delivered Jenei’s five domestic titles. The corruption of the Ceausescu regime will always stain Steaua’s league records. Jenei himself, however, would again prove his own managerial ability on the international stage. Having broken one duck for eastern Europe as a whole in 1986, he broke another for his country in 1990. At the World Cup in Italy, he guided Romania beyond the opening round of a tournament for the first time in their history. And he would follow it in Euro 2000 by taking them to the quarter-finals. It remains the country’s best ever international performance. If 90% of any football match is decided on the training ground, then Scarone went as far as anyone to cover the remaining 10%. So intense were his famous training matches between Penarol’s first team and reserves that thousands of fans often flocked to watch. The end product was an intense, combative and powerful team that won the first two Copa Libertadores. Only Pele’s Santos prevented a treble in 1962. But, having been denied that landmark, Scarone then went and secured another. In 1972, he became the first coach to take a Peruvian club – Universitario – to the competition’s final. That followed a spell in which he won nine domestic titles across three countries. It wasn’t all success for Scarone as he couldn’t get Peru to the 1974 World Cup while some odd tactical choices let him down at a number of other teams. But the scale of the victories outweighed such set-backs. If not the original footballing nomad, he was the ultimate one. And he picked up a lot of trinkets along the way. Across almost 30 jobs in 14 domestic leagues and four national teams, Ivic won eight domestic titles and six cups – a trophy for every country he managed in. Indeed, the Split native prided himself on the fact he could win something in any stadium he arrived. And, to a degree, there is no more transparent example of ‘management’: the capacity to translate your ability regardless of location or level. Certainly, Ivic was often praised for a highly strategic mind that could weigh up any given scenario. His tactical acumen was legendary. But he applied it to other areas as well. His employment options for one. Some critics have claimed Ivic was too careful about which clubs he joined, partly explaining the extent of his trophy count. It is notable that a number of jobs came at teams who were on the crest of a wave or generally dominant anyway. As football writer Adam Bate has also written, “it seems likely that his intense training methods had a significant impact in the short term”. Porto forward Joao Pinto said “he was the only coach who ordered me to train three times a day: before breakfast, after and in the afternoon”. A short-term coach, there is still no denying his list of trophies is lengthy. Having impressed the Real Madrid hierarchy during their European Cup bout with Nice in the 1956-57 season, French title-winning Carniglia was promptly hired by Santiago Bernabeu to take his team to the next level. And, for a brief time, the Argentine did exactly that. Using his defensive acumen as a player to necessarily fortify Real’s backline, Carniglia brought the club one of only two doubles they won during the five-year spell of European Cups. However, a failure to retain the domestic title – and recognise an unfit Ferenc Puskas’s remaining quality – cost him his job. And, having found himself in the middle of a glorious era at Real Madrid, he was too often between them at other clubs. Carniglia joined Fiorentina after they reached a European Cup final and joined Milan just after they won one. Other than a Fairs Cup at Roma, he couldn’t replicate his earlier success. A career with many contradictions. Despite the public clamour to appoint Parreira as Brazil struggled to qualify for the Japan-Korea 2002, he wasn’t exactly overly popular for the two World Cups he actually presided over. Despite ending Brazil’s 24-year wait for the trophy in 1994, Parreira was given very qualified praise for the functional style of football. In 2006, then, his stars played the kind of stuff many expected. But they were also too complacent to make it past the quarters. Four years later, Parreira equalled Bora Milutinovic’s record of managing five different countries in a World Cup. Unlike the Serb, though, Parreira couldn’t take any of them beyond the first round except Brazil. Most of his club success came in his home country too, although Parreira did claim a Turkish title with Fenerbahce. Ultimately, however, he is the only Brazilian coach other than Mario Zagallo to win all possible international titles. From a country that has won that much, it’s a fact that demands respect. To a degree, Robson could be described as an incomplete imitation of Alf Ramsey. Just like his predecessor in his first two full jobs, Robson took Ipswich to unseen heights and restored England to respectability. Unlike Ramsey, though, he couldn’t win the competitions that mattered: not the league title nor World Cup. In saying that, though, Robson managed in more competitive times and places. The English league was experiencing its greatest variety of winners when Ramsey saw victory with Ipswich while the country also hosted that famous World Cup win. Because, on reflection, it was Robson’s achievements far away from England that saw him outstrip Ramsey. As well as the Uefa and Cup Winners Cups with Ipswich and Barcelona respectively, Robson won two domestic titles in each of Holland and Portugal. Just one more major trophy would have seen him far higher on this list. Unfortunately, he couldn’t claim one. The king of the Copa America – or the South American championship as it was known then. Stabile won an unmatched six titles in the competition. And he did so by exemplifying Argentina’s philosophy of ‘La Neustra’ – our own. But, at a time when the country rarely played internationals outside their own continent, they became too content playing an ultra-aesthetic style. Such insularity cost them when it came to the biggest stage. Stabile’s side were beaten 6-1 by Czechoslovakia on their return to the World Cup in 1958. Although they also “took the mickey” out of Northern Ireland in a 3-1 victory – according to midfielder Jimmy McIlroy – it was actually a sign of Stabile’s increasing flaws. At the least, he still had his domestic record to stand on by that stage. Allowed also manage Argentine clubs during his long spell in charge of the national team, Stabile won three consecutive titles between 1948 and 1951 – one with Huracan and two with Racing. Modest personality, massive prizes. Four alliterative words that pretty much sum up Del Bosque. Little wonder, then, that the four years before Florentino Perez unceremoniously discarded Del Bosque were the only time since 1960 that Real balanced sustained domestic success with repeated victories in their holy grail. 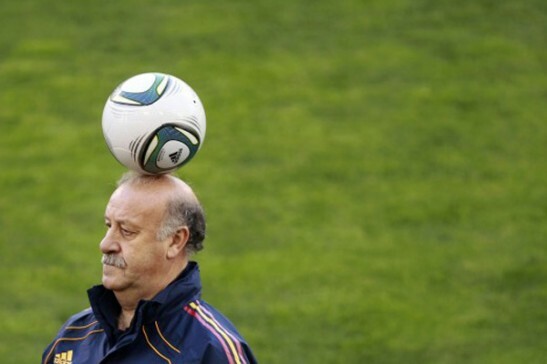 Because, really, that was what Del Bosque was all about: balance. Steve McManaman said exactly that in lionising his former coach. And, certainly, he kept Spain ticking along after the euphoric Euro 2008 victory. Because even after fatigue and pressure initially threatened to derail their 2010 World Cup, many of the players praised Del Bosque for his calm reassurance. In that, he may have appeared hands-off. And that may well have cost him in his one true failure at Besiktas. It’s also unclear whether he can actually fire a team as opposed to just facilitate talent. But it all meant he got his hands on football’s biggest prizes. A larger-than-life character, Goethals went by many titles and won even more. The first was ‘Le Socier’ and the early part of his career was certainly marked by alchemy. He first took lowly K Sint-Truidense to second in the Belgian league before bringing the national team to their first World Cup in a generation and third-place in Euro 72. Later known as Columbo because of his long trench coat, it was a case of “won more thing” on joining Standard in the ’80s (with apologies for an atrocious pun). From there, he embarked on a sustained run of success which culminated in the Champions League with Marseille after three years of thrilling football. Although that final season ended in disgrace for his boss Bernand Tapie, Goethals discarded any doubts about himself by winning a final Belgian title with Anderlecht in 1993-94.